For my grandson. He likes it and wears it very often. DryBlend Wicking Performance and an 8-ounce thick construction makes this hooded jacket a very cozy option. Double-needle stitching throughout ensures durability, finished with YKK metal zippers. 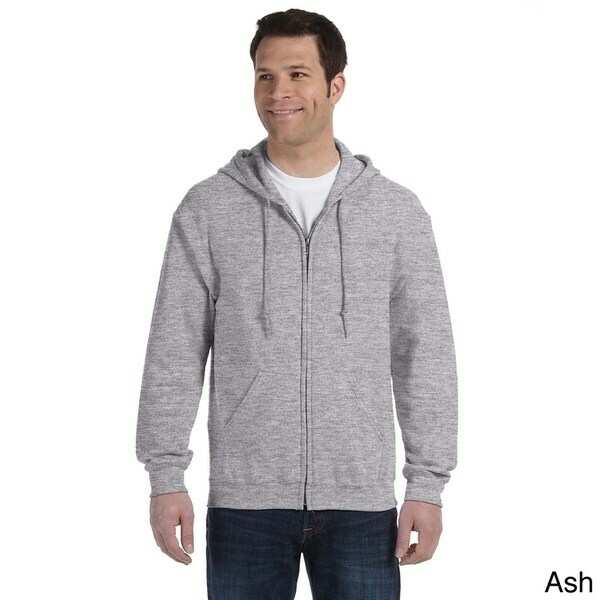 I love my Gildan Men's Heavy Blend 50/50 Full-zip Hooded Jacket. I bought it to match my maroon boots. Since I am a woman working outside, I wear this jacket under a vest for additional warmth. The hoods on most hoodies are too small. They don't come forward on one's had enough, at least for me. This one is perfect. The price is right. The quality seems good, although I've had mine for only a week. (I work in a refrigerated building.) The zipper handle is a bit small for my fingers, but it works. I intend to buy several more of this hoodie. Grandson loves the zip-up hooded sweatshirt. I love the good weight, no shrinkage and true blue color, despite weekly washings. Excellent jacket. Wear it all the time. Not too thick and fits nicely under my heavier jackets. It is also just fine in it's own as a lightweight cover up. I highly recommend it for either purpose. I purchased this heavy duty hoodie for myself in an extra large purposely wanting it to be oversized. This way my husband can wear it as well. It's very nice and warm and looks good on. Soft and comfortable hooded sweatshirt. Great for cool summer nights! Fits perfectly. Glad I bought the size I thought I needed. It’s the perfect spring jacket. wear it all the time, gets dirty throw it in the wash doesn't shrink in the dryer! Please make sure the color is correct. I once ordered "ash" but I received "sport grey". I returned previous order and trying to get the correct color for this order. I have been looking for this color in a zipped sweatshirt for a long time. The % off made me decide to order. Thank you.